For the third straight day, the Yankees put together an embarrassing and lifeless performance in Boston, falling 4-1 to the Red Sox at Fenway. It's almost hard to believe that a team with as much talent as this Yankees group could look this pathetic in the most important series of their season, but here we are. With today’s season-high fourth straight loss, New York is now a season-high 8.5 games out of first place in the AL East. If you weren’t pressing the panic button regarding the Yankees division standing before today, you should be now. Let’s start with the lone positive to come out of this game. Chance Adams put together a very solid start considering all that was stacked against him today in his MLB debut. It would have been very easy for the 24-year-old to fall apart after serving up a two-run home run to Mitch Moreland in the opening frame, but he bounced back and gave the Yankees five quality innings. Adams was pumping his fastball all day, throwing 53 of his 83 (64%) pitches for strikes and working quickly. Besides the Moreland home run, Adams’ other blemish was a solo home run by J.D. Martinez in the fourth. It was an encouraging start for a pitcher thrown into a very unfair situation. The game was finished off by Chad Green, who threw a scoreless sixth inning, and A.J. Cole, who allowed one run over two innings. Offensively, the Yankees were pitiful for the second straight evening. After coming up with only one hit last night, the Yankees mustered just five hits today and once again scored only one run. 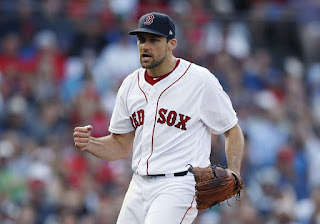 Nathan Eovaldi looked like Nolan Ryan as he mowed through the Yankees lineup to the tune of eight shutout innings, three hits allowed and only 93 pitches thrown. 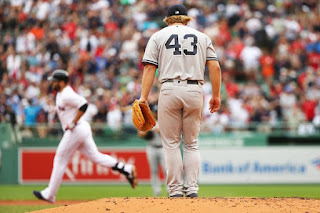 Craig Kimbrel came on to finish the ninth and was extremely shaky, allowing the Yankees to score their only run on the day and bring the go-ahead run to the plate with two outs. On the day, Giancarlo Stanton had two doubles, and that was about it for the New York offense. In the last two games, the Yankees have scored one run on four hits against Rick Porcello and Eovaldi. It’s unfathomable and downright unacceptable. Through three games in this series, the Yankees have simply been outclassed. Boston is beating the Yankees in every aspect of the game (offense, defense, pitching, base running, effort) and it is nauseating. New York has shown no sense of urgency and no fight in these contests. At some point, someone is going to have to make it clear to this team that what we have seen the last few days in Boston is not okay. The time for excuses is over. It's time for a look in the mirror and a reality check about where the Yankees stand right now. They are a much better team than this and it's time they start playing like it. The Yankees will try to save some face and avoid a sweep at the hands of Boston tomorrow night in the final game of this four-game series. Luckily for New York, their hottest pitcher will be getting the ball. Masahiro Tanaka (9-2, 3.84 ERA) has fired 15 straight scoreless innings in his last two starts and will look to keep that going against Boston. On the other side, David Price (11-6, 3.97 ERA) is on the mound for Boston. Price has pitched to a 26.34 ERA in two starts against the Yankees this year, so there is some hope for the team’s suddenly anemic offense. The game can be seen at 8:05pm on ESPN.